How awesome it is that we have a God of comfort and peace to help us in our time of need. The Holy Spirit, which is also called the comforter is living inside believers. We can pray to Him for comfort, encouragement, and for daily strength. He will help remind us of God’s faithful words whenever we’re hurting or discouraged in life. Give God all that is in your heart. I can’t explain the awesome peace that God gives through prayer. Nothing in this world can compare. 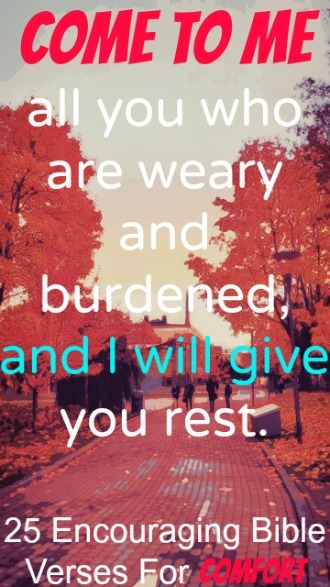 Let’s learn more with these comforting Bible verses. 1. Isaiah 51:3 The LORD will comfort Israel again and have pity on her ruins. Her desert will blossom like Eden, her barren wilderness like the garden of the LORD. Joy and gladness will be found there. Songs of thanksgiving will fill the air. 2. Psalm 23:4 Even when I walk through the darkest valley, I will not be afraid, for you are close beside me. Your rod and your staff protect and comfort me. 3. 2 Corinthians 1:5 For the more we suffer for Christ, the more God will shower us with his comfort through Christ. 4. Isaiah 40:1 Comfort, comfort my people, says your God. 5. Psalm 119:50 This is my comfort in my affliction, that your promise gives me life. 7. Isaiah 51:12 “I, yes I, am the one who comforts you. So why are you afraid of mere humans, who wither like the grass and disappear? Yet you have forgotten the LORD, your Creator, the one who stretched out the sky like a canopy and laid the foundations of the earth. Will you remain in constant dread of human oppressors? Will you continue to fear the anger of your enemies? Where is their fury and anger now? It is gone! Jesus weeps over our sorrows. 9. Psalm 56:8 You keep track of all my sorrows. You have collected all my tears in your bottle. You have recorded each one in your book. 10. Psalm 119:76-77 Now let your unfailing love comfort me, just as you promised me, your servant. Surround me with your tender mercies so I may live, for your instructions are my delight. God comforts us in our trials so we can comfort others. 13. 2 Corinthians 1:3-4 All praise to God, the Father of our Lord Jesus Christ. God is our merciful Father and the source of all comfort. He comforts us in all our troubles so that we can comfort others. When they are troubled, we will be able to give them the same comfort God has given us. 14. 2 Corinthians 1:6-7 Even when we are weighed down with troubles, it is for your comfort and salvation! For when we ourselves are comforted, we will certainly comfort you. Then you can patiently endure the same things we suffer. We are confident that as you share in our sufferings, you will also share in the comfort God gives us. 15. 1 Thessalonians 5:11 Wherefore comfort yourselves together, and edify one another, even as also ye do. 16. Psalm 62:6-8 Truly he is my rock and my salvation; he is my fortress, I will not be shaken. My salvation and my honor depend on God; he is my mighty rock, my refuge. Trust in him at all times, you people; pour out your hearts to him, for God is our refuge. 18. Deuteronomy 3:22 Ye shall not fear them: for the Lord your God he shall fight for you. 19. Psalm 27:1 The Lord is my light and my salvation; whom shall I fear? the Lord is the strength of my life; of whom shall I be afraid? he leads me beside peaceful streams. He renews my strength. He guides me along right paths, bringing honor to his name. 22. Psalm 138:7 Though I walk in the midst of trouble, you preserve my life. You stretch out your hand against the anger of my foes; with your right hand you save me. 23. 2 Corinthians 4:8-10 We are afflicted in every way, but not crushed; perplexed, but not driven to despair; persecuted, but not forsaken; struck down, but not destroyed; always carrying in the body the death of Jesus, so that the life of Jesus may also be manifested in our bodies. 24. Psalm 112:6 Surely the righteous will never be shaken; they will be remembered forever. 25. Psalm 73:25-26 Whom have I in heaven but you? I desire you more than anything on earth. My health may fail, and my spirit may grow weak, but God remains the strength of my heart; he is mine forever.